You depend on your feet a lot. Making sure that you take care of them is a high priority for any worker. This means choosing the right kind of work footwear for your occupation. Because, while a standard set of earplugs or safety glasses may cover a wide range of occupations and possible hazards, the right safety shoes may require a lot more consideration to make sure you get the right one. Workplace foot hazards exist in many different forms. The best way to protect employees is to control these hazards at the source using engineering, work practice and administrative controls. When these controls are not feasible or do not provide sufficient protection, proper footwear personal protective equipment (PPE) must be used. Footwear must be chosen based on the hazards at your site. For example, if you work in a place where you may be at risk of falling objects, choosing a boot based on ankle support isn’t addressing the appropriate risk. Steel-toe work boots are a great and traditional protection for several hazards on many different work sites, but are they the right choice for you? Taking the extra time to make sure you know just what you need could make a world of difference. ASTM F2413, Standard Specification for Performance Requirements for Protective (Safety) Toe Cap Footwear, covers minimum requirements for the design, performance, testing and classification of protective footwear. Footwear certified as meeting ASTM F2413 must first meet the requirements for impact and compression resistance. Then the requirements of additional sections such as metatarsal protection, conductive protection, electric hazard resistance, static dissipative protection and protection against punctures can be met. Here are some of the most frequent potential hazards that require foot PPE. Take a look and see which shoes are made with those hazards in mind. You can also use our safety shoe selection guide to help identify shoes for your work needs. If you work around explosives or other highly reactive or flammable substances, you will likely need electrically conductive shoes. Electrically conductive work footwear helps prevent the buildup of static electricity on the worker. Without this precaution, static buildup on your body could easily generate a spark that could cause a fire or explosion. Silk, wool and nylon socks should not be worn in this type of work environment or with this type of shoe, as those materials are more likely to produce static as well. Working with chainsaws, or any other rotating blades make protective footwear absolutely necessary. Cut-resistant chainsaw boots (and other cut-resistant clothing) can prevent serious injuries in the face of an accident involving a chainsaw. These are made from specific materials that create a protective barrier from spinning blades. 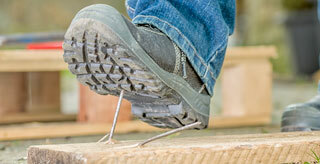 If you are at risk of falling items, you will surely want safety toe boots. These are boots that have a capping over the toe area for protection. These toe cappings were traditionally made of steel, hence steel-toed boots. However, now they are also available in composite materials. Some work footwear has additional protection along the metatarsal region (the top of your foot). If you have ever dropped anything on the top of your foot, you know how much it can hurt. Metatarsal boots are good for work environments where rolling objects or machines present a risk. Any job that involves heavy machinery, heavy loads, or dangerous conditions can require the use of metatarsal boots. Working in cold conditions means dressing to keep warm, and your shoes are no exception to this. Insulated work boots are a must if you work outside or are exposed to other cold conditions. Feet not properly insulated against the cold are in danger of frostbite and other cold-related risks. Water-resistant leather boots are a popular choice when working in wet conditions where moisture is an issue. Working outside means being exposed to elements, and almost always puts you at a risk for getting wet. Keeping your feet dry helps protect them against the cold. Water-resistant footwear protects against mold, rot and fungus growth. Slip-resistant shoes are required for a large variety of industries. Healthcare workers, kitchen workers, wait staff, industrial workers, factory workers—the list is almost endless.Slip-resistant shoes come with a sole that reduces the slickness that can cause a fall or accident. Working with molten metals presents huge risks. Foundry shoes are made specifically for these types of occupations. These are designed to insulate against the extreme heat of this kind of environment. They prevent hot metals from getting lodged into the shoe’s eyelets. They also frequently come with an easy slip-off design in case of burn caused by a molten metal splash. Of course, there are a few more factors to consider when buying the right work footwear. You should make sure you feel supported in your arch and ankle, and that you can stand and move in them comfortably. You will also want to be sure they fit well; a loose-fitting shoe can be a work hazard itself. Always make sure the footwear you choose matches the guidelines set by your company, and for the type of work you do. Protect your feet well—they’re all you’ve got to stand on!